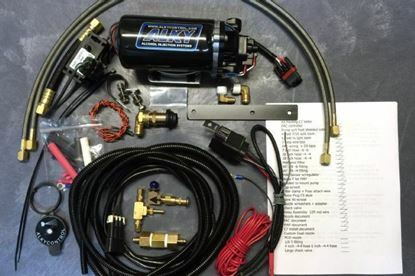 Alkycontrol Methanol Injection kit for the C7 Corvette platform. This is the best kit on the market for the C7. Plenty of reading and feedback at www.corvetteforum.com. Features Custom made hoses, fittings, wiring, instructions etc. Modified Pump 250+ PSI, protective cover to keep water from intruding into motor, custom built Progressive controller preset for the C7 LS based platform. Custom Relay to transfer power from Fuse box to controller eliminating any interference from the system and vehicle electronics. MAF converter box 3 teflon lined braided hoses with pressed on ends custom length. Hose feature AN fittings. Meaning a wrench is needed to install and secure hoses. No push-in deal. This is a complete kit. Down to the custom tank fitting and grommet for the reservoir, cap for reservoir, plug for ww pump, stainless.